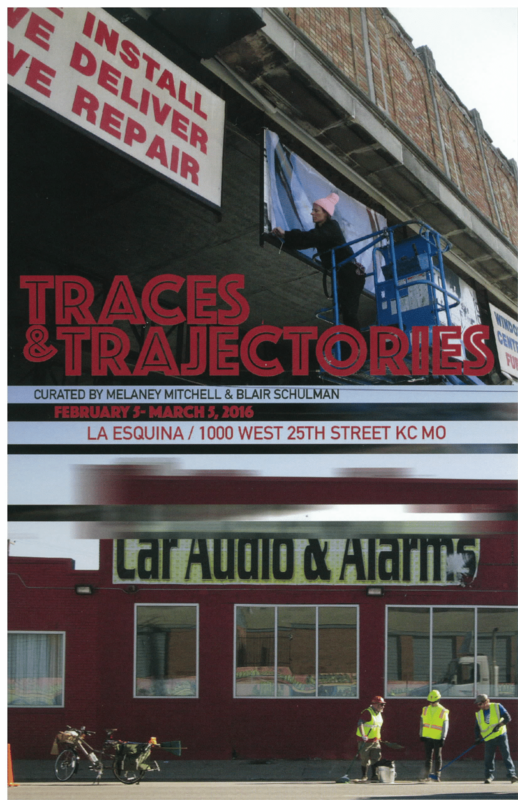 The Traces and Trajectories retrospective kicks off its programming this Saturday, February 6th with two Rocket Talks happening at La Esquina. Both Rocket Talks are FREE and open to the public! At 1PM on Saturday, February 6th, artists Judith G. Levy and Jessica Borusky will host their Rocket Talk, Elaborations: A conversation about persona and place. Judith G. Levy and Jessica Borusky will host a conversation with one another about the role of persona and place in their work. They will show projected images as they discuss how they individually explore narrative, locale, provocation, humor, memory, objects and queer theory to create multi-disciplinary work that investigates assumptions, omissions, and ideology in formal presentations of history and culture. Attendees will have an opportunity to ask questions at the end of the conversation. At 3PM on Saturday, February 6th, artist Dave Loewenstein will host his Rocket Talk, A discussion about the arts and creative placemaking. Give Take Give, Dave Loewenstein’s Rocket Grant supported project from 2013, focused on the improvised gift economy and social space that emerged within and around a local dumpster near his home in Lawrence, KS. The project was propelled by a new wave of upscale development that was encroaching into the beloved working class neighborhood of East Lawrence. Three years down the road and the pressure of development pushing gentrification has reached a fever pitch, bolstered by a new planning strategy known popularly as Creative Placemaking. This has become the rallying cry, economic argument, seduction, and defense for a host of new initiatives to increase “vibrancy” in places deemed unvibrant. In response to a new multi-million dollar Placemaking initiative announced in 2015, some East Lawrence neighbors launched the East 9th Street Placekeepers with a website (eastninth.net) that looks deeply at Placemaking projects across the country. Here in the gallery on February 6th from 3-5:30pm, a group of invited artists, planners, neighbors and others will engage in a facilitated dialogue about the role of artists in this new development paradigm. Visitors are welcome to come listen. Check out the Facebook event or https://rocketgrants.org/ for more information.